Description: An MP15AC pulls a long cut of cars out to be readied for an outbound train. Description: A single Gevo brings a phosphate train into Saint Paul. Description: Train 291 gets ready to depart Saint Paul with a AC44 trailing. It would wait for a BNSF rock train to pass before heading up the hill. Description: After seeing this unit hiding under 44th on the CP-BN a few days back, I was very pleased to see it working the west end of Humboldt Yard with the 6049. Description: Two CP SD40-2s kick cars on the west end of Humboldt Yard. It was a nice sight seeing two of them together on the CP in 2009. Description: The CP-BN leans into the curve as it struggles up the hill with four classic EMD motors. Description: Two veteran SD40-2s lead the CP-BN up the hill by Como Ave. This was both a cool sight and sound. Description: A great lashup on the CP-BN grinds upgrade near Como Avenue. Seeing four spartan cabs together was a throwback to how things were five years ago. Description: After a small rain storm, this CP freight heads west into the sun which is just breaking through the clouds at Azelia Ave. Description: An all rail train kills time at Humboldt Yard with a Peterbilt truck. Description: Third unit on the CP-BN today is Soo 4425. Description: Todays Transfer 1 makes a trip to New Brighton to pick up a scrap gone just past the last boxcar. Description: This freshly repainted CP GP38-2 is the second unit in an SD40-2 sandwhich. Description: Todays Dresser Turn is loaded and has a new crew on it as it waits for permission to head back to Humboldt Yard. Description: Todays Dresser turn waits for Transfer 1 to clear so it can head back to Humboldt Yard. With the SD60s stored, there has been a very welcomed resurgence of CP SD40-2s in the Twin Cities. Description: Transfer 1 departs New Brighton creating a classic image of a Caboose bringing up the rear. Description: CP 5927 holds down the 4509 and 6054 with about 10 empty rock cars at Humboldt Yard. Notice how the 5927 is missing part of its striping on the nose. Description: The CP-BN transfer gets moving after waiting at University for a little bit. Description: After seeing this unit about five years ago on a Rock Train, I ran into it again at Saint Paul waiting for its next assignment. Description: Two sets of of geeps idle away at Humboldt Yard on a great May day. Seeing the 2057 was nice, however it was very sad to see that the 4525 had gotten tagged. Description: After finishing its work at Cowin, Transfer 1 heads back to Cardigan Jct. The deep colored clouds are some storm coulds that passed though earlier, sorta reminds me of when I caught two AC44s at Azelia Ave a few weeks back. Description: After waiting for a while, the Dresser Turn came blowing by with all three units putting on a show. In this shot you can see I even got the strobe lit up on the Soo 4425! A very memorable catch indeed. Description: Much to my delight, after waiting a while, the Dresser Turn showed up at Withrow. However, I soon found out that the crew is dead on the hours, and a relief crew will soon be on duty to take the train to Humboldt. Description: This being my first encounter with the 4451, I was happy to spot it on Transfer 1. I like the later version turbo the 4451 sports. Description: If only this unit was leading, but none the less, this was nice to see. Description: CP 9714 brings a freight up to CP University with two AC44s and a GP38-2 in tow. Its pretty clear that the 9714 was once a Christmas Train unit. Description: Todays Dresser Turn is running a bit later today with a pair of good looking CP SD40-2s. The 6069 is the second unit. Description: Two CP geeps rest outside the yard office at Humboldt Yard. I like seeing those ex Milwaukee units still active and working. Description: Trailing on 493 today is a well aged CP SD40-2. Description: CP 8531 will lead 493 today. The best part about this lashup was the CP 5939 trailing. I wonder why all that steam is coming off the 8531. 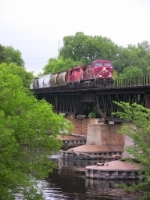 Description: On an overcast day, two CP units bring 493 across the Mississippi River and towards Humboldt Yard. Description: Trailing on what is to be tomorrows Dresser Turn, CP 4421 relaxs for the time being. 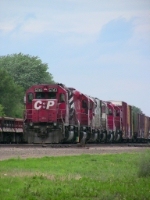 Description: CP 6044 sits between two other units as it waits to head off to Dresser. With the SD60s stored, I've been having a great time see a lot of CP SD40-2s running around the Twin Cities. Description: Tomorrows Dresser Turn waits for a crew at Humboldt Yard with a very nice set of power. It'll sound great roaring up Shoreham Hill tomorrow morning. Description: Two dual flags AC44s bring a mixed train of stacks and autoracks past Park Jct. Description: After waiting for the light, the crew now has permission to head back to Humboldt. Description: As I recorded video, I took this shot, and the Dresser Turn went from silence to roaring 645s as it went into notch eight as it prepared to climb to grade west of Cardigan Jct. Description: As I biked to Little Canada to get the Commercials Hugo Job, I was pleasantly suprised to see this rock train sneaking up behind me. I quickly got my camera out and fired off a quick shot. I really like this perspective. Description: Train 580 does its best to get moving after making a quick stop at the depot. Those three geeps really dug in to get going. Description: An ex Milwaukee Road unit is the second unit out on 580 today. Description: A pair of CP AC44s cruise past the Hastings depot on a semi cloudy day. Description: Two Gevos bring a grain train over the Mississippi River and head to Black Bird to have a meet. Description: The power from todays change off idles away at Humboldt yard with six standard cab EMDs for power. Description: Four CP SD40-2s wait for the next call to duty by the depot at Humboldt Yard. The 6066 is missing the "CP" lettering on the nose. The last unit is CP 5747. Description: CP 6066 waits for the light at Victoria St before heading back to Humboldt Yard. Description: A loaded Columbia Coal train makes its way over the Hastings lift bridge and over the Mississippi River on a hazy morning. Description: Coming onto the mainline with the Soo 4442 and CP 8640. Description: An interesting lashup comes onto the main at Shoreham as the 8640 as two geeps trailing. Picture taken from video. Description: After notching up under the highway bridge, the 8757 and its train bang over the BNs diamonds as it heads west. This is the same train I ran into at Newport about three hours earlier. Description: Two CP Gevos bring a train up to Saint Paul with a large cut of flats on the head end as a BNSF worm trains waits in the distance for the light.